A parking lot sculpture hopes to point SFCC students beyond the blacktop. But they've got to notice it first. The installation sits back beyond the far row of parking spots, on a berm overlooking a valley. Its collection of geometric shapes reach into the sky, framed by electrical wires and clouds. It may not be evident at first blush, but it’s a piece of art. Sitting in a parking lot. The piece, “Sign Post,” was produced by Annie Han and Daniel Mihalyo, also known as Lead Pencil Studio. 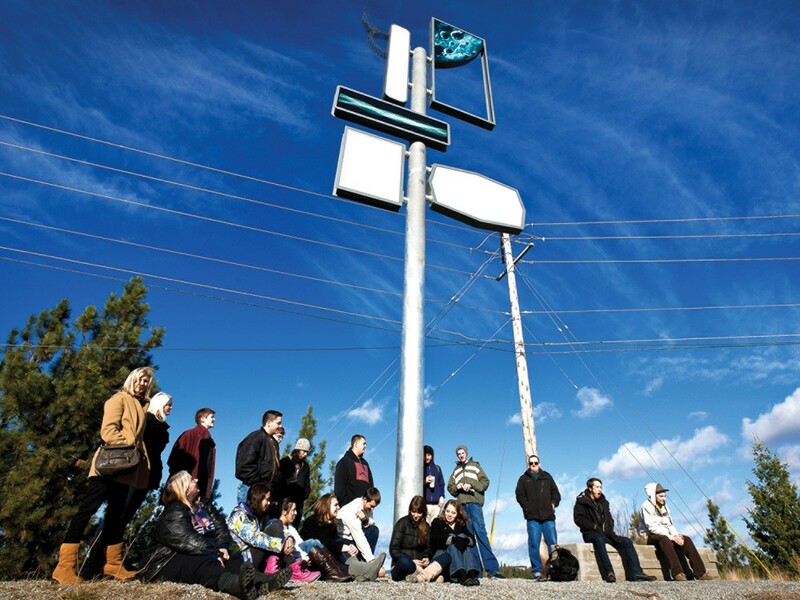 The duo, known for pieces around the Pacific Northwest that mix art with architecture, had “Sign Post” installed last summer as part of a state mandate to provide public art along with any new building construction. The piece consists of a pole reaching skyward with several geometric shapes — and an arrow — meant to represent signs. At night, the shapes light up in a dreamy sort of teal, highlighting lines on the signs and, in one case, what looks like a strand of DNA. “I didn’t even realize it was there,” says Kristin Stratte, 20, as she opened the door to her car several rows away. “I’ve got to be honest with you, it’s probably the first time I’ve looked at it,” says Mike Rhodes, 43, as he stands outside a minivan less than 50 feet away. The piece hadn’t yet become illuminated for the night. Rhodes says that might affect his impression of it. As commercial aircraft lumber overhead and a string of cars make an exodus from the campus lot, Stratte gets the piece within a few seconds of noticing it.